A restoration like this one requires repeated fitting, trial assembly, disassembly for painting, and eventually permanent reassembly. 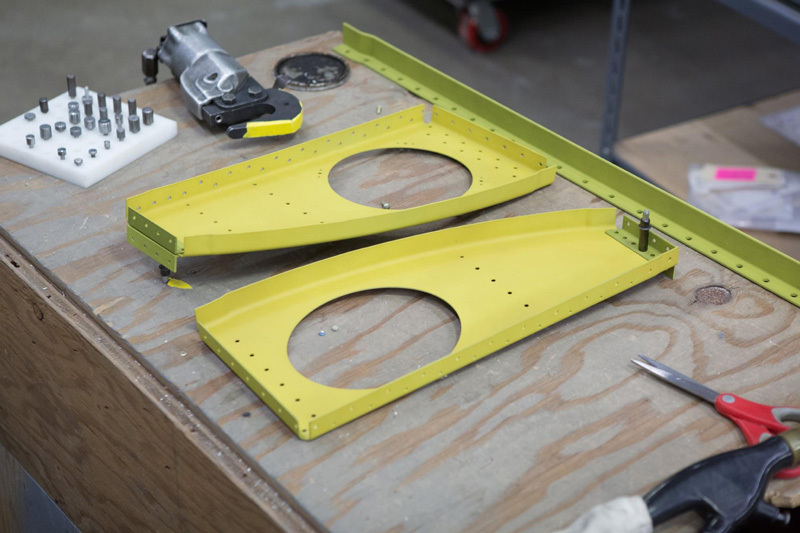 This month was all about details as the guys take care of final touches before disassembling the upper fuselage for deburring and paint. Once this is finished, the next step will be permanent reassembly. 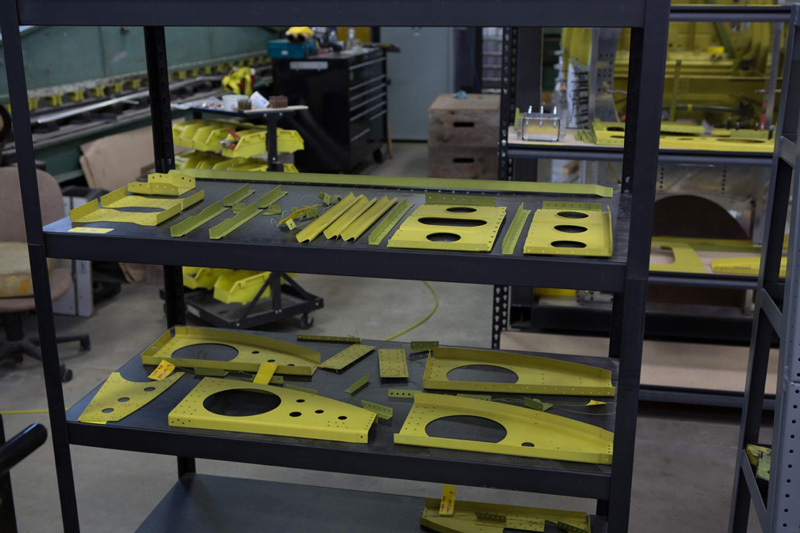 The reassembly process requires that parts are prepared, inspected, and restored as necessary, and ready when the time comes for their installation. 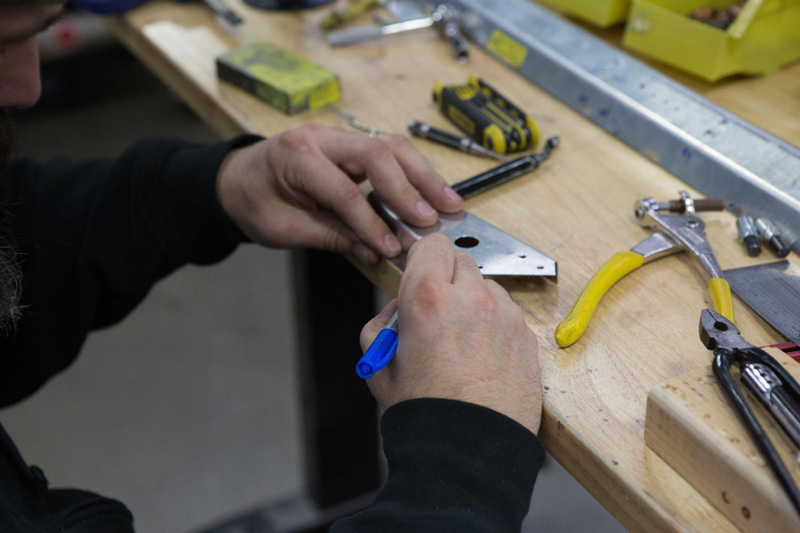 Because of that, parts preparation is a continual process that ensures smooth progress on the restoration. 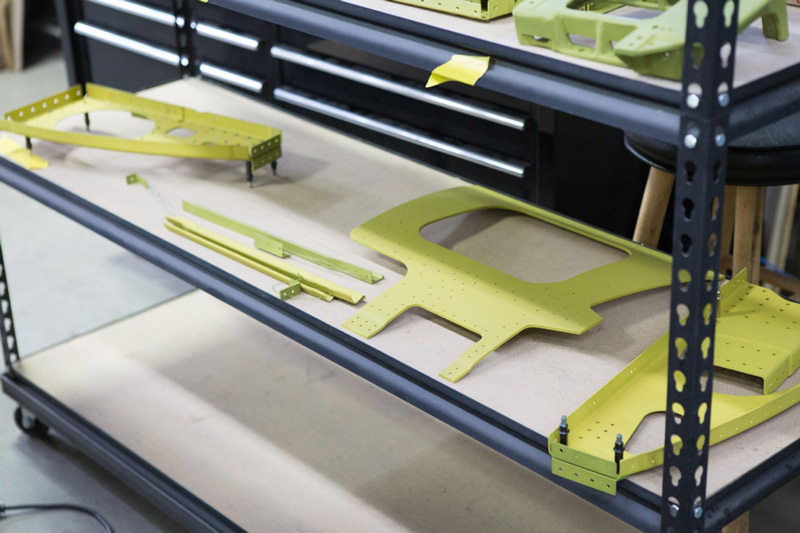 P-47: Parts and SubassembliesThese fuselage longeron assemblies will run along the canopy rail area. 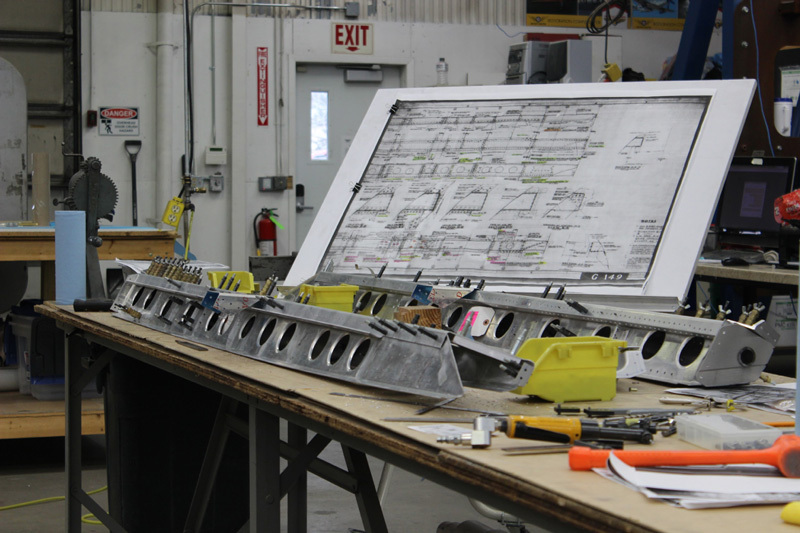 P-47: Parts and SubassembliesThis is another angle showing the upper fuselage longerons and the reference drawing. 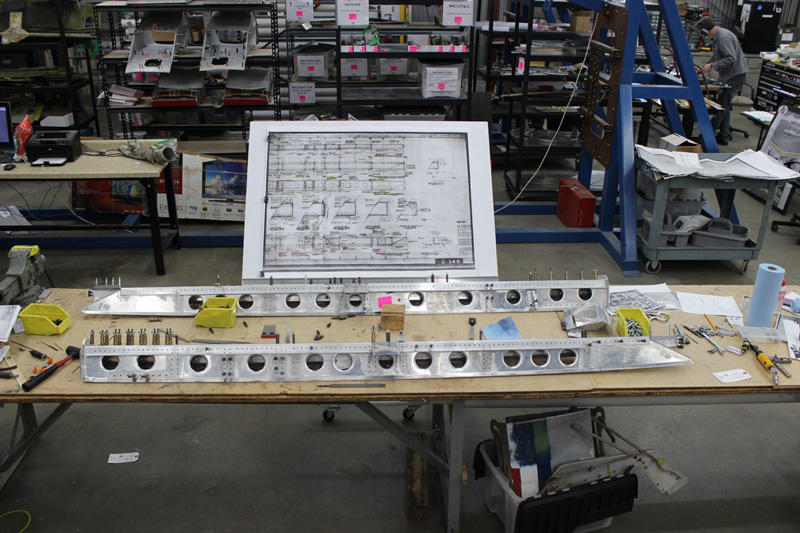 P-47: Parts and SubassembliesTailwheel assembly parts are laid out on the bench. 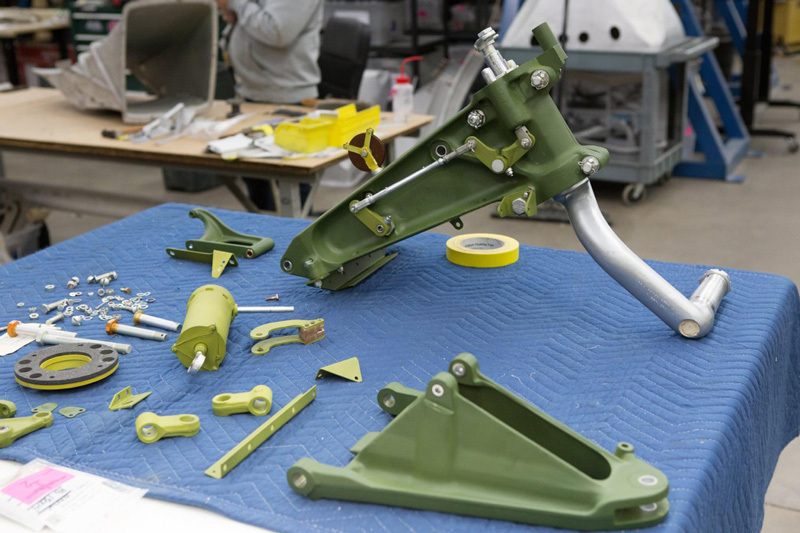 The large casting in the foreground is the tailwheel oleo strut brace. 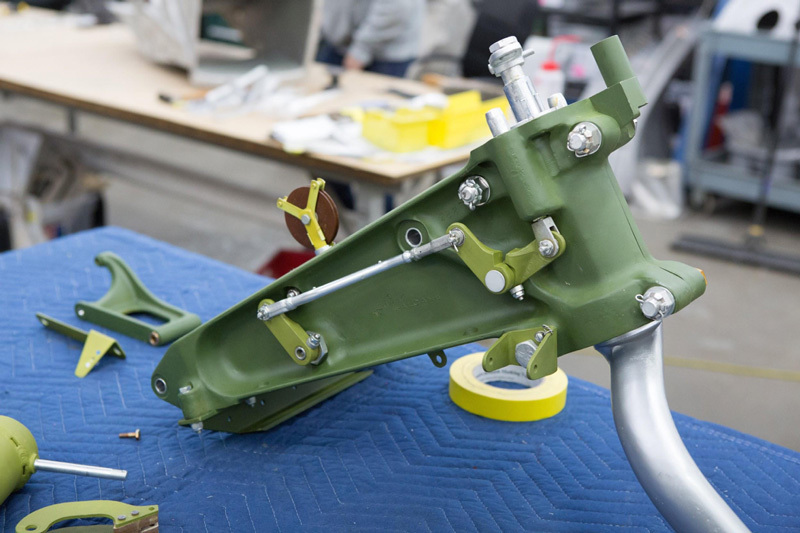 P-47: Parts and SubassembliesThe linkage visible in this image of the tailwheel assembly is the tail wheel lock linkage. The phenolic pulley guides the cable that actuates the lock. 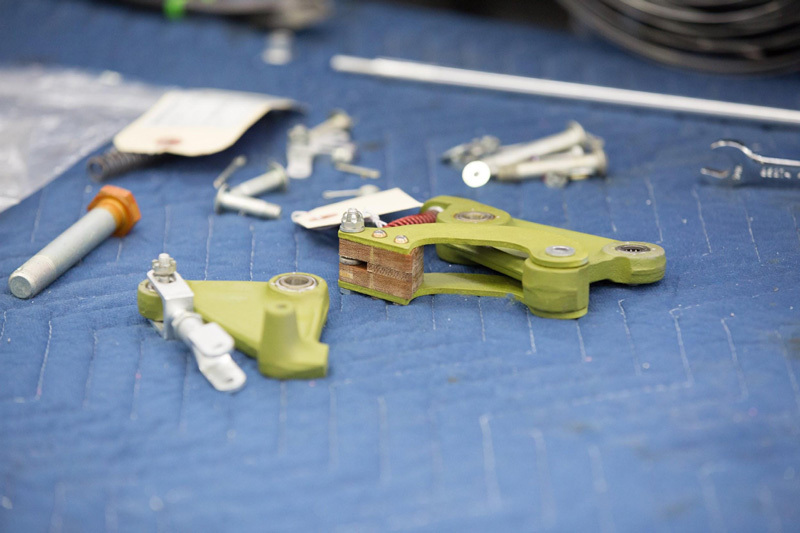 P-47: Parts and SubassembliesRandy marks one of the canopy rail formers. P-47: Parts and SubassembliesThis interestingly shaped subassembly goes inside the carburetor intercooler air intake duct. 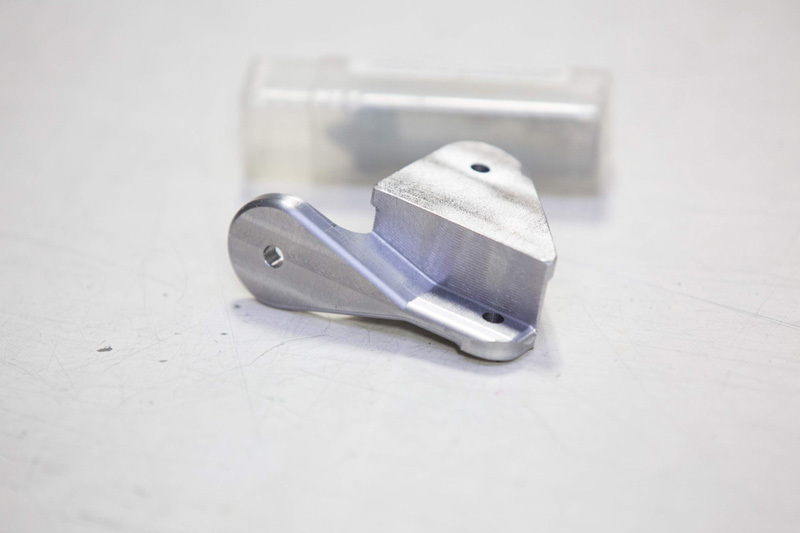 It functions as an air separator to prevent turbulence in the airflow to the intercooler. 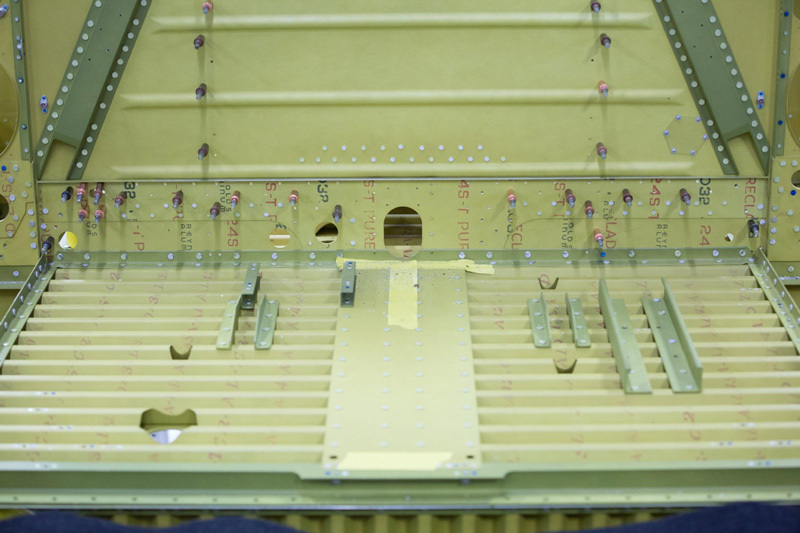 The internal fuselage structure needs to be protected with zinc chromate, as was done at the Evansville factory. 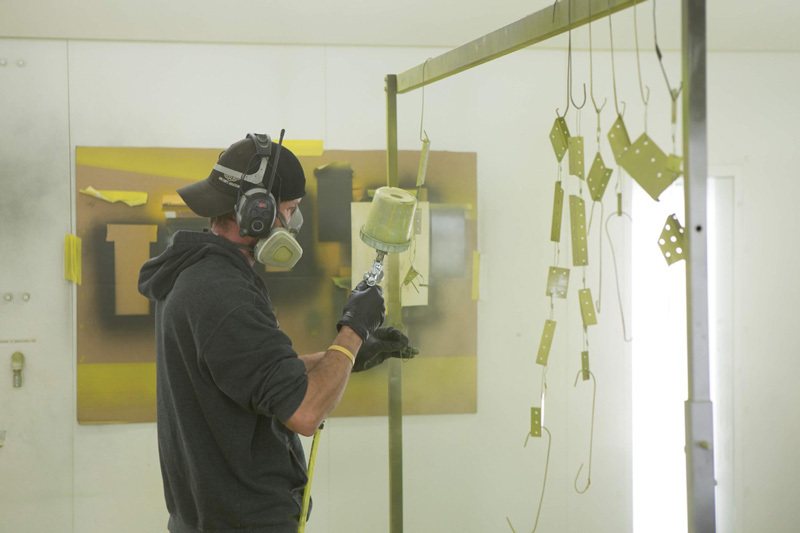 P-47: PaintDave applies the zinc chromate paint to some small brackets and braces. 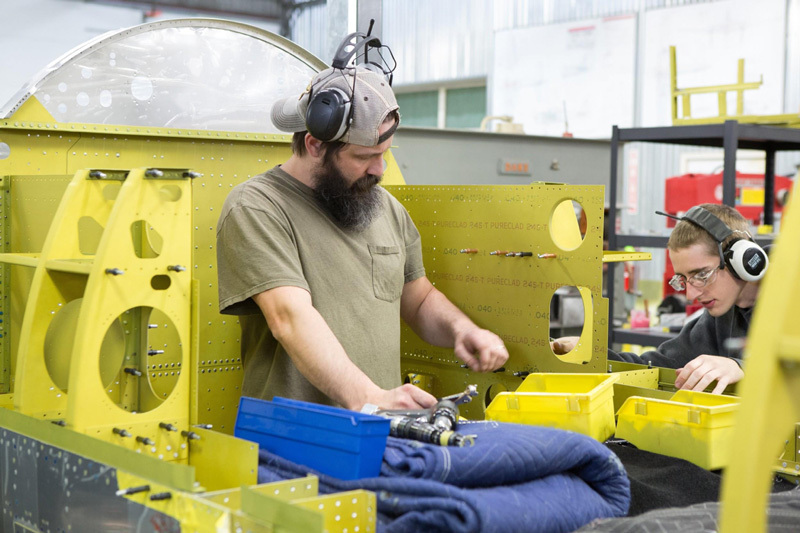 P-47: PaintRight side upper forward fuselage formers are being assembled after painting. 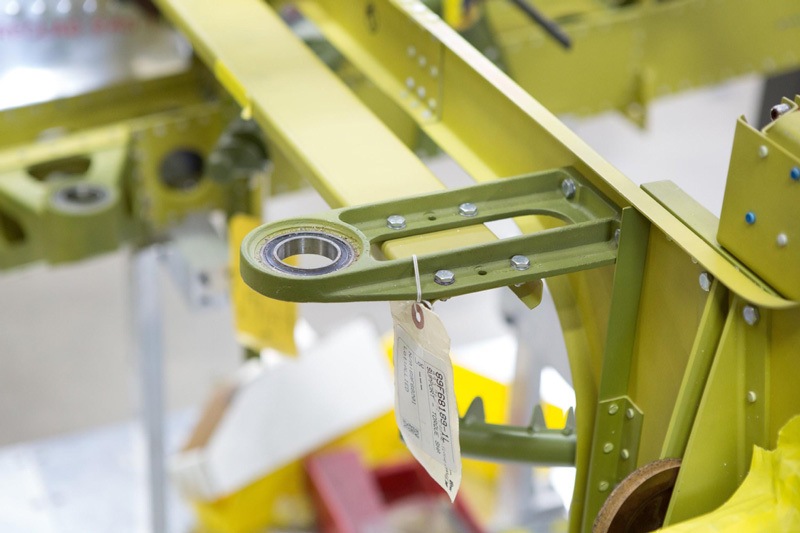 P-47: PaintSome side frame members and the plate assembly with the hydraulic inspection hole are ready to be installed. 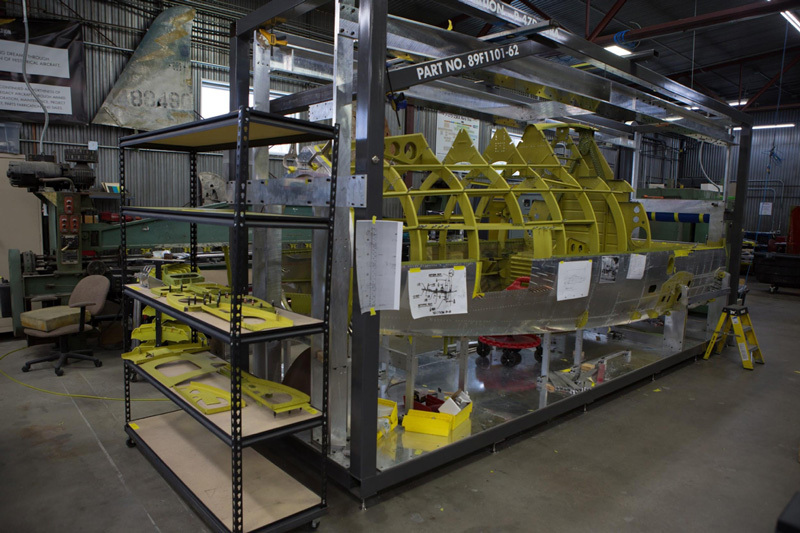 P-47: PaintFuselage frame components await their turn for permanent assembly. P-47: PaintRobb works on the main fuel tank bay cover. P-47: PaintAaron drills one of the fuselage bulkheads. 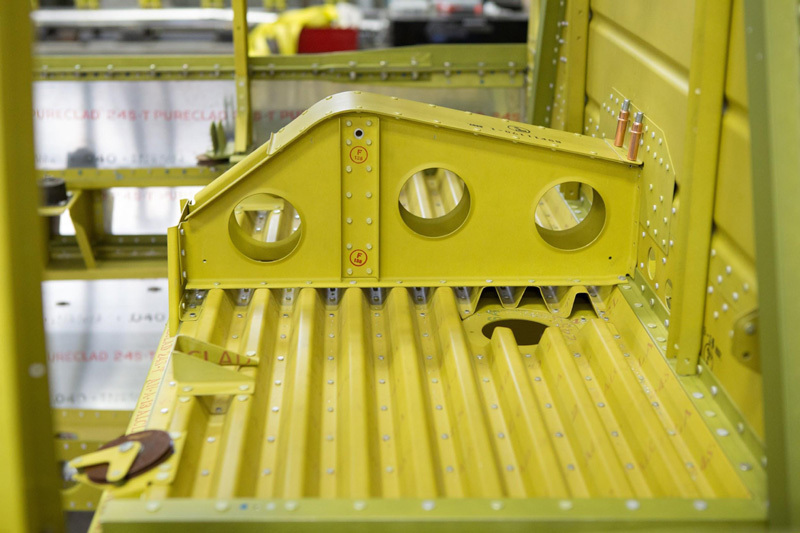 P-47: PaintThis bulkhead is the firewall. 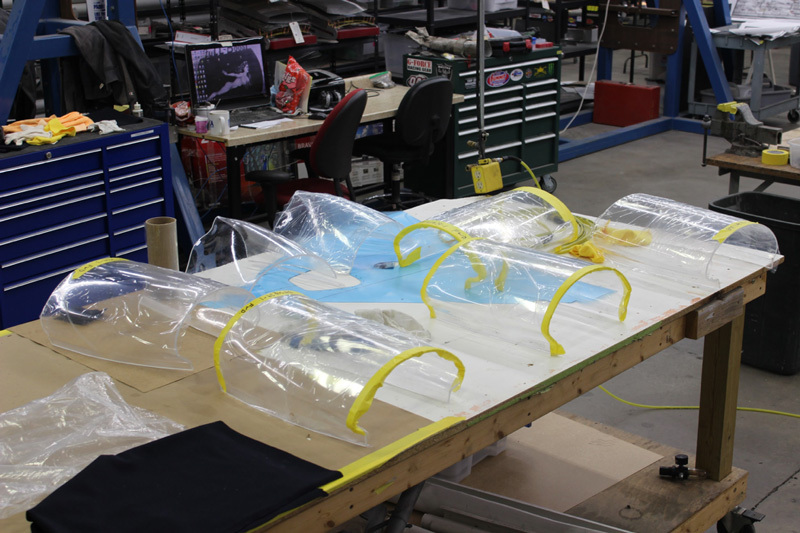 The frame and window panels of the Razorback model are a complex assembly. 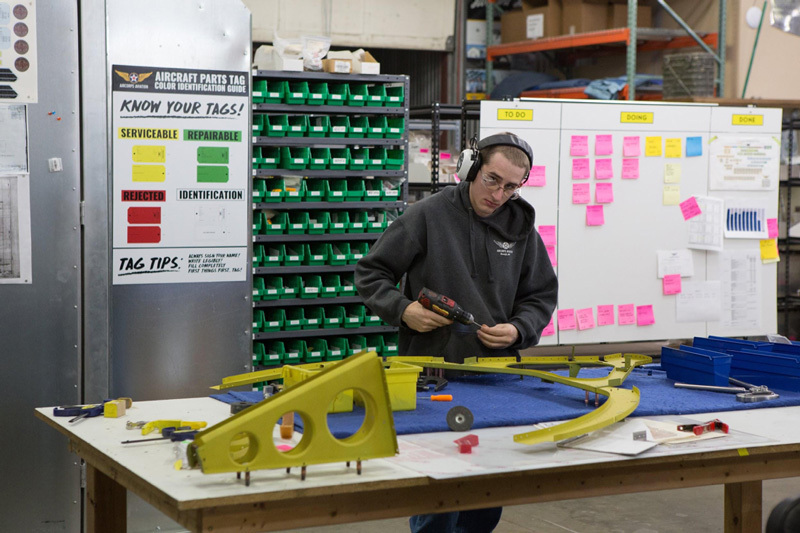 George and Ryan have been working at getting the parts ready for when that assembly becomes needed. P-47: Cockpit EnclosureGeorge is forming window retention frames. P-47: Cockpit EnclosureThere are quite a few cockpit enclosure frame sections! P-47: Cockpit EnclosureGeorge has also been thermo-forming acrylic canopy sections. 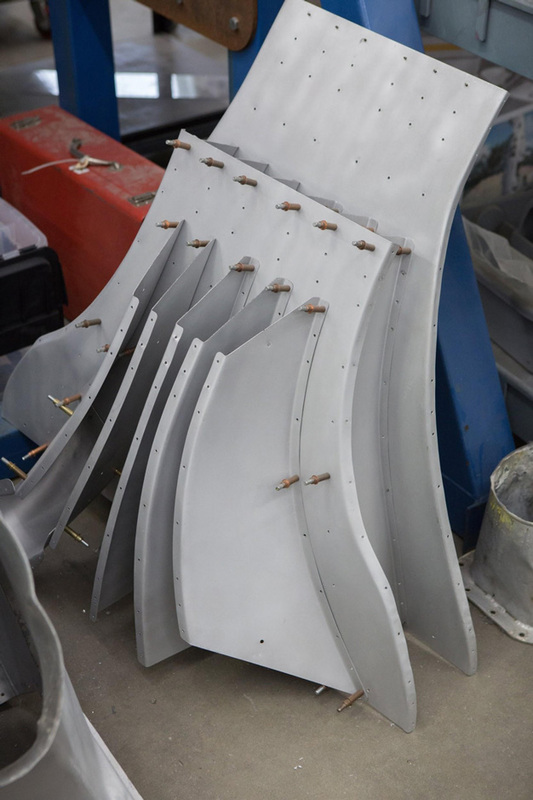 These are top sections for the Thunderbolt restoration, along with the extras we usually produce once the tooling and procedure for a part has been developed. P-47: Cockpit EnclosureA different angle also shows the formed top cockpit enclosure sections on the bench. P-47: Cockpit EnclosureGeorge works at polishing the top cockpit enclosure acrylic. 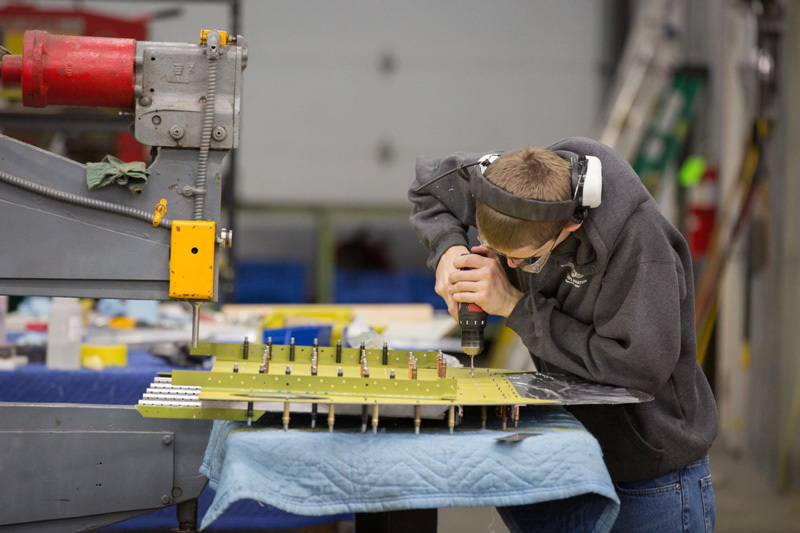 P-47: FuselageAaron squeezes a rivet on a fuselage former. It will be the second fuselage former back from the cockpit, station 197.5. 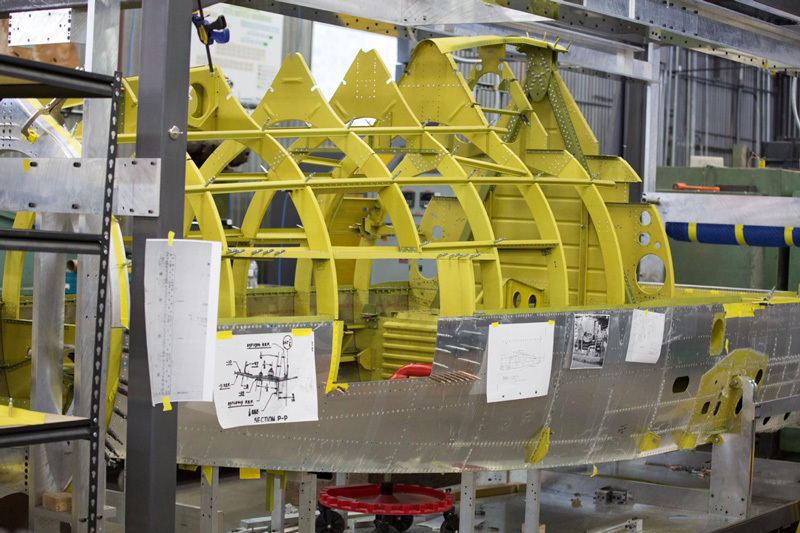 P-47: FuselageFinal assembly for the station 197.5 former continues. P-47: FuselageIn this view of the left side of the fuselage, the space for the former Aaron was working on is visible just behind the bulkhead with the A-frame rollover structure. 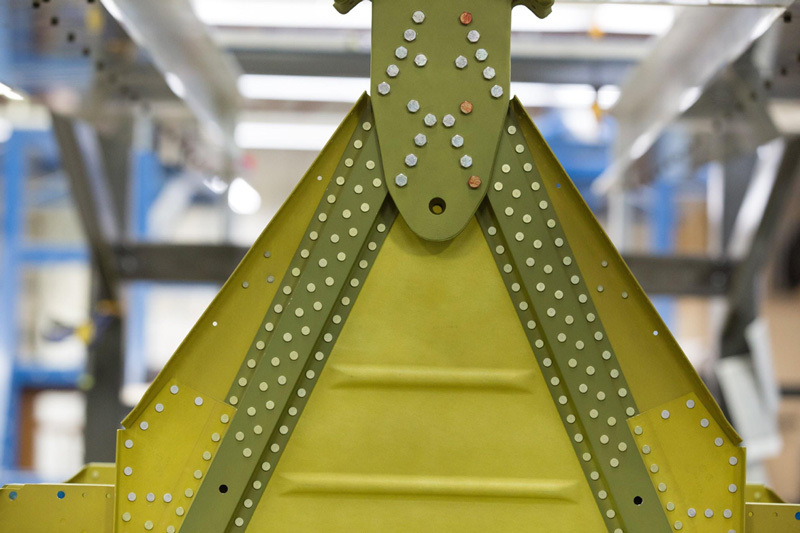 P-47: FuselageNow that they have visited the paint booth, some of the upper rear fuselage formers are permanently riveted in place. 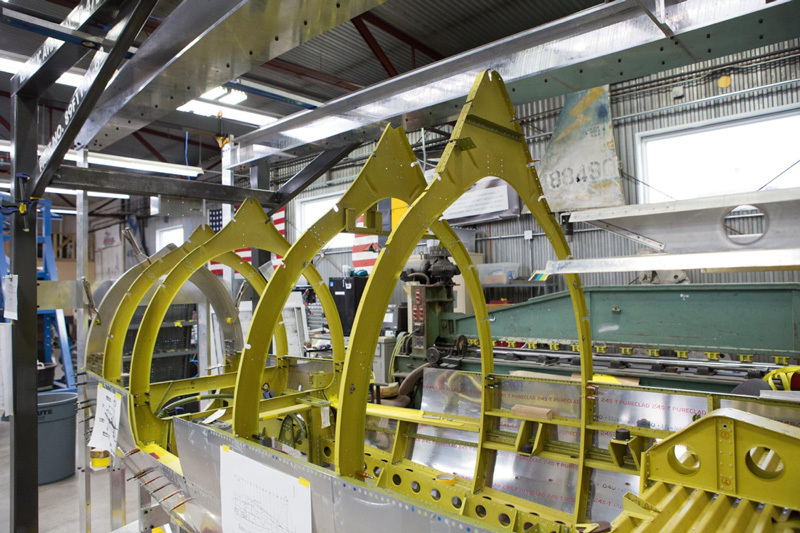 P-47: FuselageLooking forward through the inside of the fuselage structure from station 285 where the tail cone will eventually attach. 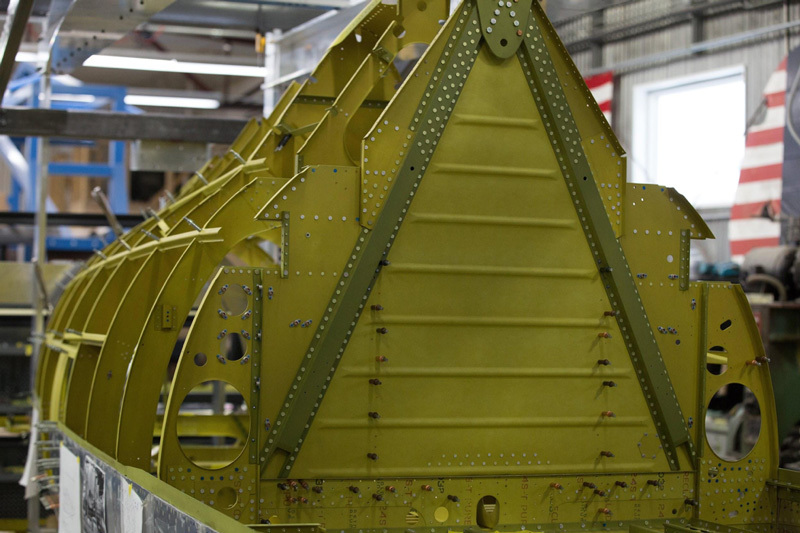 P-47: FuselageA rear angle shows the newly reinstalled formers with the holes in the skin where the intercooler doors will eventually be attached. 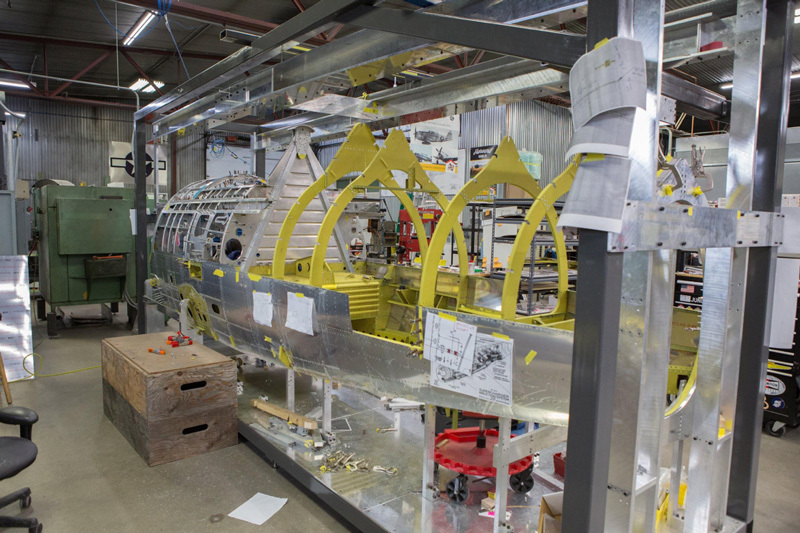 P-47: FuselageRandy stands in the main fuel tank bay as he and Aaron fit the painted walls with clecoes before riveting. P-47: FuselageThe lower intercooler door control torque shaft support is in place permanently. 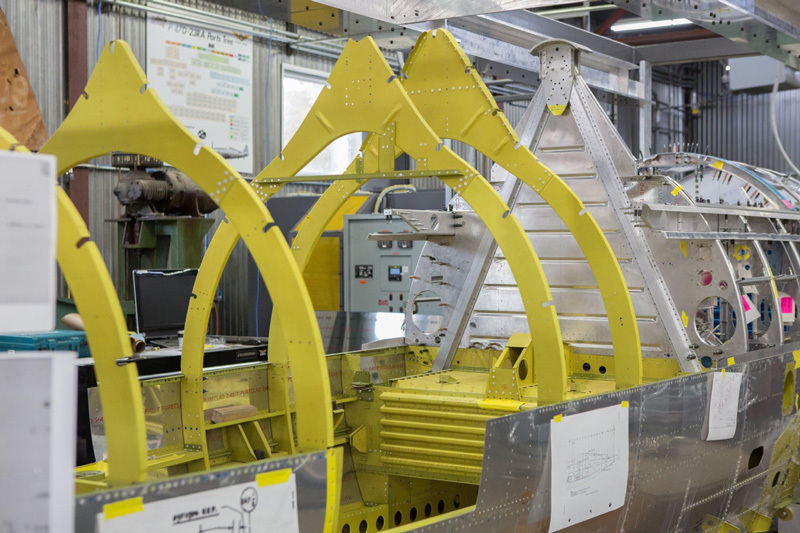 P-47: FuselageAaron works at installing fuselage formers. 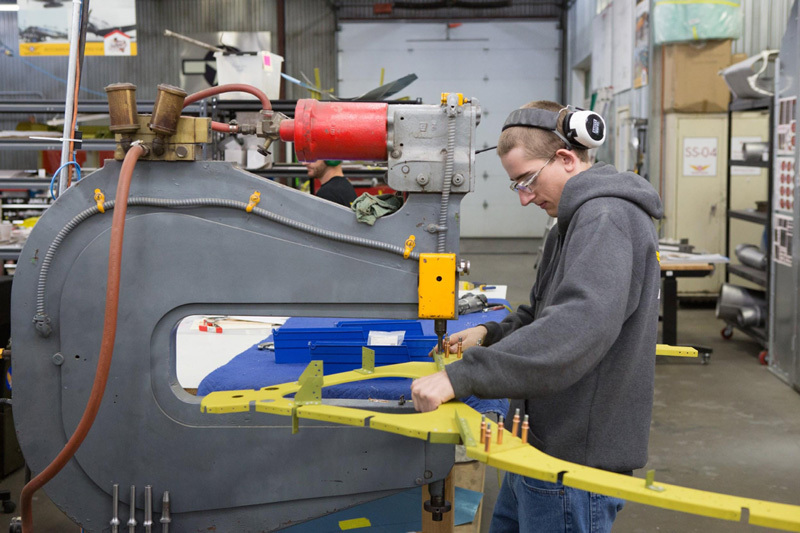 P-47: FuselageTiteSeal sealant is specified in this area of the fuselage for weather proofing. 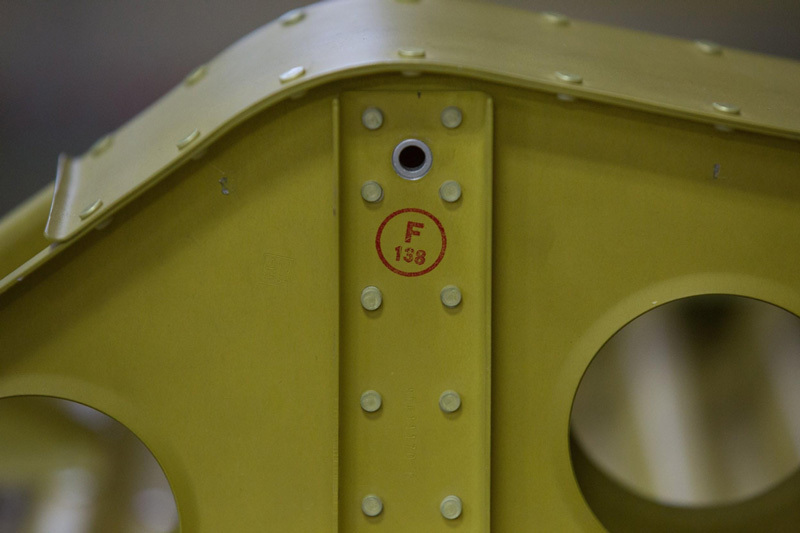 P-47: FuselageThe inspector stamp applied to the elevator support assembly shows in this detail image. 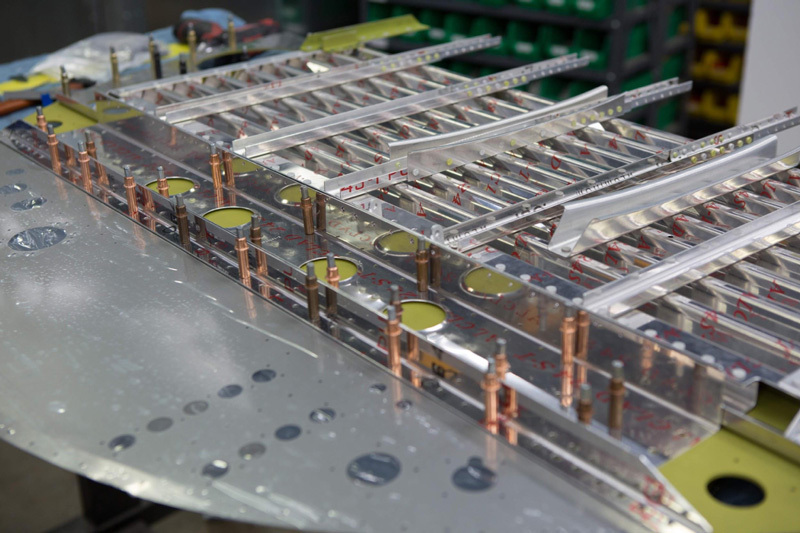 P-47: FuselageHere we can see the whole length of the forward fuselage in the fixture. P-47: FuselageThis view shows some of the rear fuselage longerons and stringers in place. P-47: FuselageThe cockpit floor has been partially riveted in this image. P-47: FuselageThe rear cockpit bulkhead and rollover structure is in. P-47: FuselageThis closeup shows the top casting of the rollover structure. 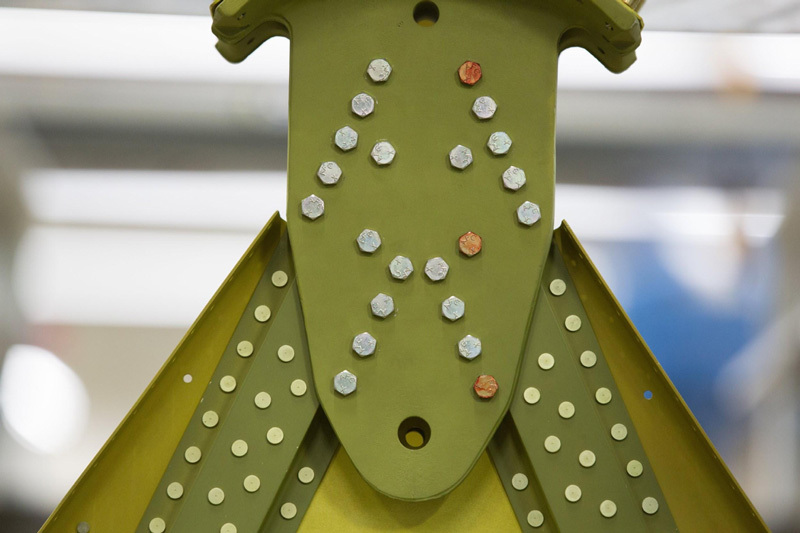 Many of the bolts are stained and at this time we haven’t found a definitive consistent pattern to the colors. Dye marking meant that the bolts were magnetically inspected. The colors probably varied by manufacturer. With modern bolts, the heads of magnetically inspected bolts are dyed green or blue. The Republic P-47 was the heaviest single engine fighter to see combat in WWII. The sheer bulk of a P-47 dwarfed any other Allied single engine fighter. It was also the most produced American fighter of the war with 15,683 built, slightly edging out the P-51 with 15,586 produced by North American Aviation. The Thunderbolt story began with a bit of commercial diplomacy. 1Alexander de Seversky, a Russian WWI combat ace, visited the American aircraft industry as a representative of the Czarist Russian government during the closing months of WWI. During his visit, the success of the Bolshevik revolution made a return to his homeland extremely hazardous. In fact, news of mass executions of former Czarist officers by the Bolsheviks made the decision to apply for American citizenship a logical and clear choice for de Seversky. He became a naturalized citizen by 1927. During the citizenship process, de Seversky worked as a test pilot for the United States Army Air Service, and an assistant to General Billy Mitchell. In 1922 he established the Seversky Aero Corporation to manufacture aircraft parts, notably a successful bomb sight of his own invention. The company did not make complete aircraft, and went out of business following the 1929 stock market crash. However, the financial crash did not stop Seversky, and in 1931 he secured financial backing and founded the Seversky Aircraft Company to build aircraft for the military market. Major de Seversky brought in fellow Russian emigre’ Alexander Kartveli as chief engineer in 1934. The company’s first entry in a US fighter design competition was a landplane fighter development of their SEV-3 floatplane. It wasn’t successful in winning the contract. Kartveli went back to the drawing board and designed the SEV-1XP, which won the 1936 fighter design competition. 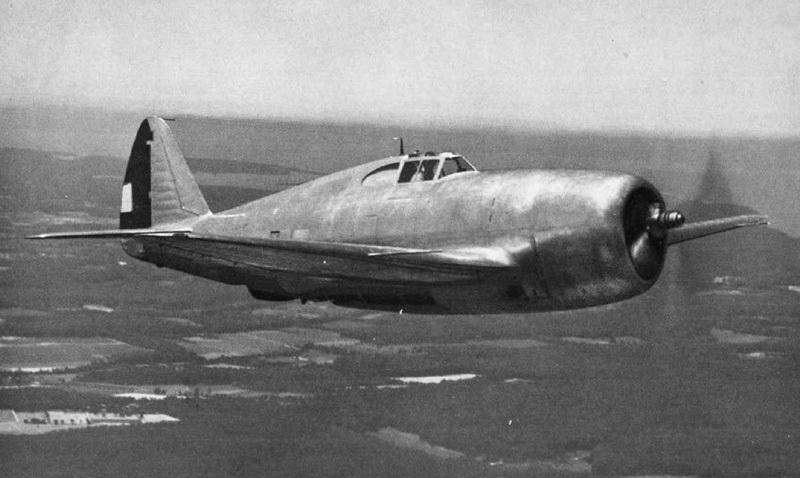 The U.S. Army Air Corps (USAAC) designated the fighter P-35, and it was the first USAAC production, single-seat, all-metal pursuit plane with retractable landing gear and an enclosed cockpit.2 The P-35 was the progenitor of a line of fighters that led to the P-47, notably including the P-43 Lancer, a fighter that incorporated a turbo-supercharger. By 1939, De Seversky had lost his company because of financial mismanagement. The company was reorganized and renamed the Republic Aviation Corporation. Alexander Kartveli stayed on as vice president of engineering, but Seversky was out. At the time, Republic was working on the designs of two lightweight fighters: the XP-44 Rocket, similar to the P-43, but re-engined with a Pratt and Whitney R2180-1 of 1400 horsepower, and the little known XP-47A, powered by a 1150 hp Allison V-1710-39 liquid-cooled in-line engine. The XP-47A was originally conceived with only two .50 caliber guns and would have weighed 4900 pounds at gross weight. Feedback from combat areas made it clear that heavier armament, armor protection for the pilot, and self sealing fuel tanks were a necessity in the existing combat conditions. 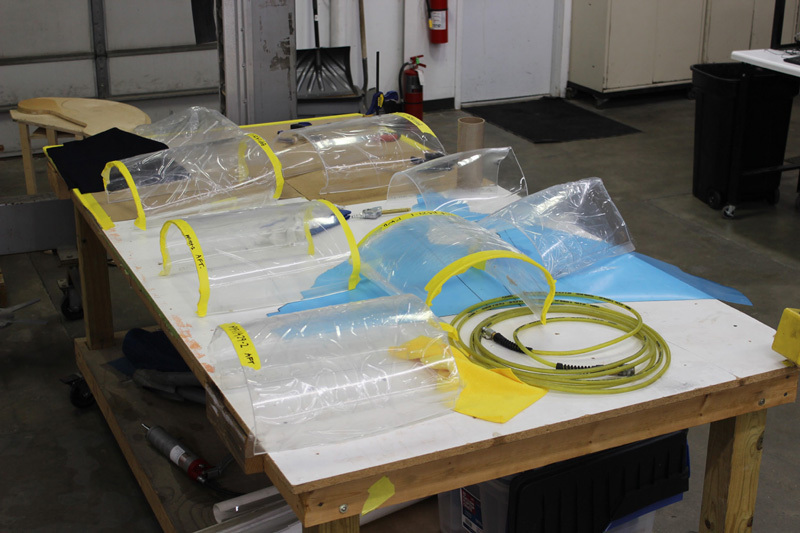 Kartveli realized that the designs he was working on had no chance of attaining those requirements, and again went back to the drawing board. The result was a new and completely different design incorporating the 2000 hp Pratt and Whitney R-2800, the most powerful aircraft engine yet developed in the US. Also part of Kartveli’s brainchild was a turbo-supercharger system that made meeting the high altitude specifications possible. The Army Air Corps was impressed enough to order a prototype on September 6, 1940 and designated the type with the same “P” number as the XP-47A, a highly unusual event for an entirely new design. Accordingly, the XP-47B prototype, became the first in the long line of WWII Thunderbolts. More history of the Thunderbolt next month. 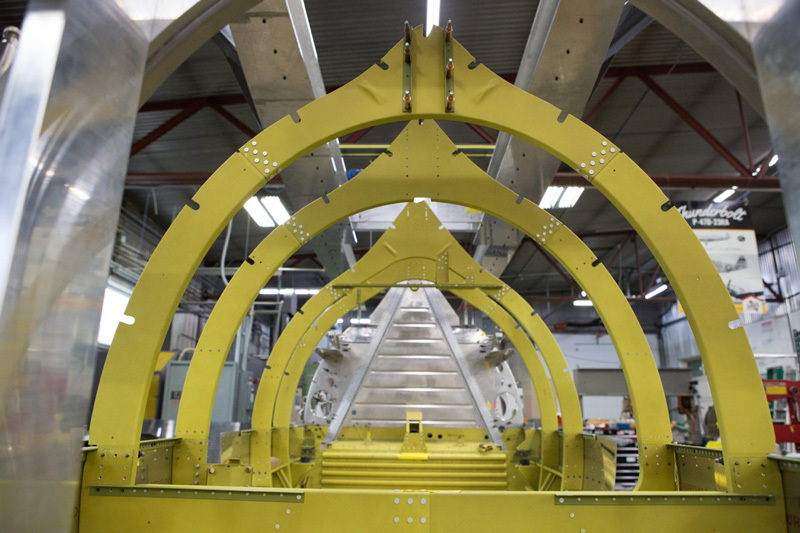 A new feature of our update this month is a time lapse as the guys reassemble the rear upper fuselage after painting the interior structure. 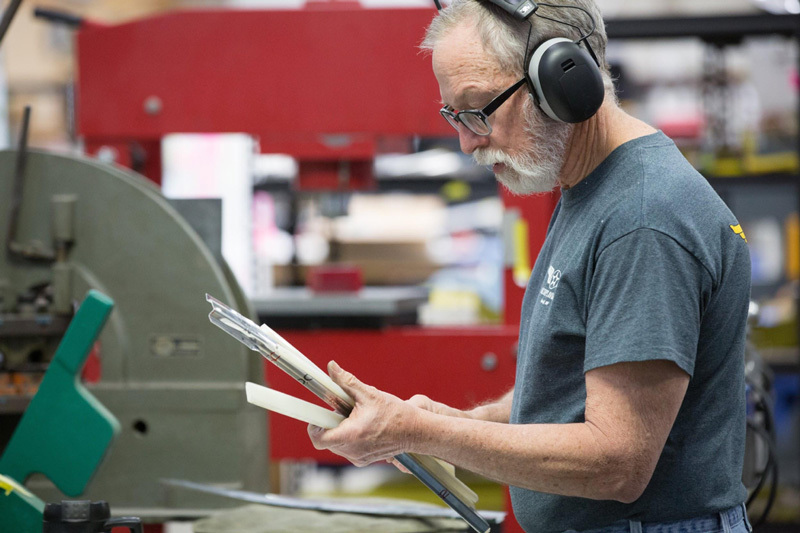 Our restoration parts coordinator, Sam Walsh, came to us from Solvang, California on the central coast near Santa Barbara. There aren’t many who would commit to such a long distance relocation. 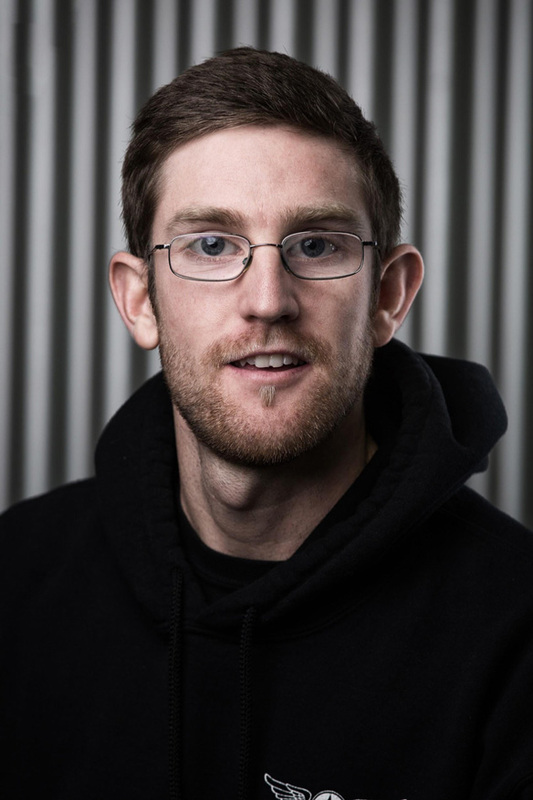 Sam joined the AirCorps team in 2014. 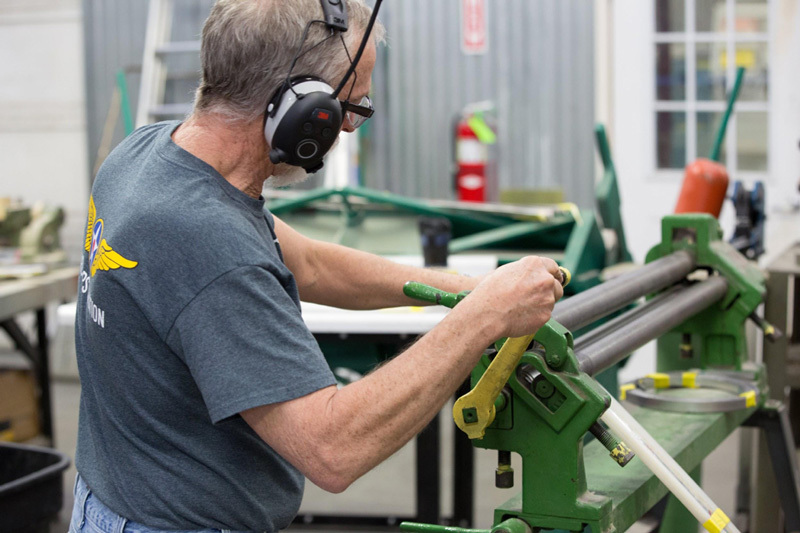 Since then, he has been a restoration technician, parts team member, parts sales coordinator, and restoration parts manager. Sam has a Bachelor of Science Degree in Business Marketing Management and Industrial Technology from Cal Poly in San Luis Obispo. He is also an instrument rated commercial pilot, and is the president of the Bemidji Flying Club. 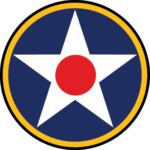 Sam is very active in the Civil Air Patrol and EAA Young Eagles program. It is clear that Sam believes in giving back to aviation. 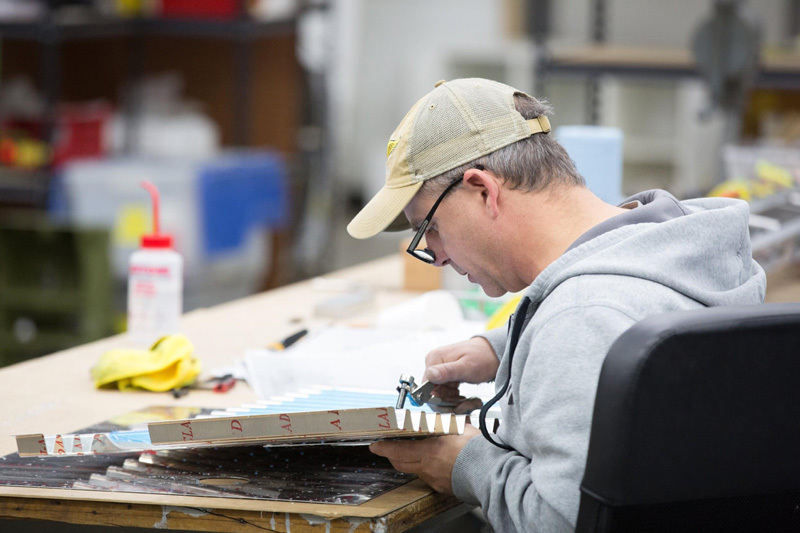 His expertise at finding rare parts, like the gun heaters unique to the P-51C, is one of the many elements that makes Sam an indispensable asset to AirCorps Aviation. Sam’s favorite warbird is the F8F Bearcat and his favorite memory from AirCorps is his first ride in a warbird he helped restore, the Bush Stearman. 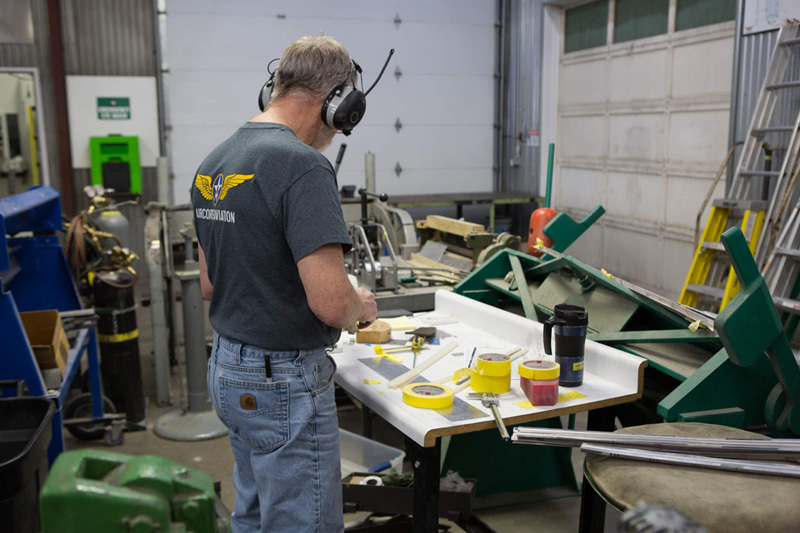 Working with folks who are passionate about warbird projects is a high point in Sam’s experience here at AirCorps Aviation. 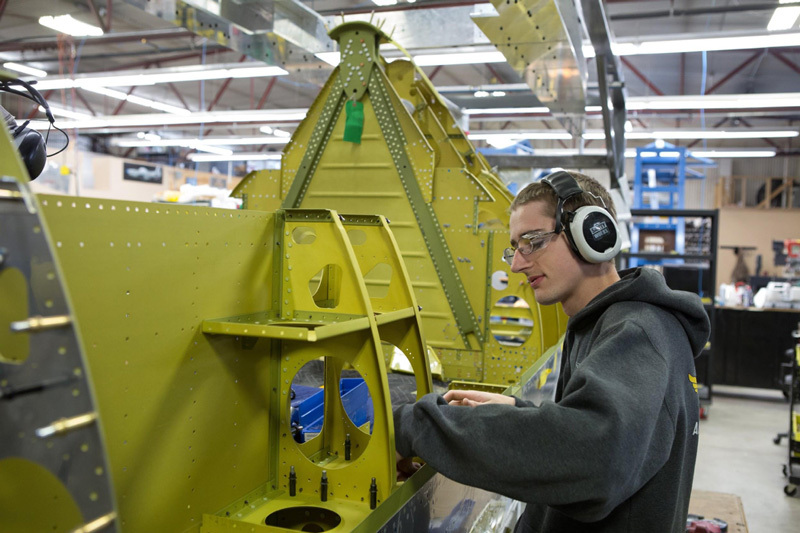 Seeing the P-47 fly and trips to Oshkosh every year are what Sam is looking forward to.